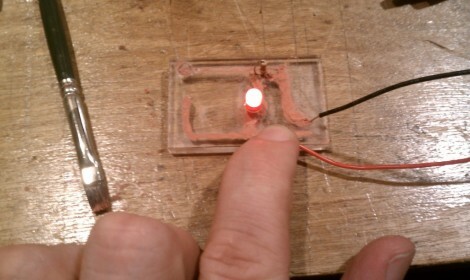 This glowing LED is proof that the experiments [Nvermeer] is doing with conductive ink are working. We’re filing this one as a chemistry hack because you need to hit the lab ahead of time in order to get the conductivity necessary for success. 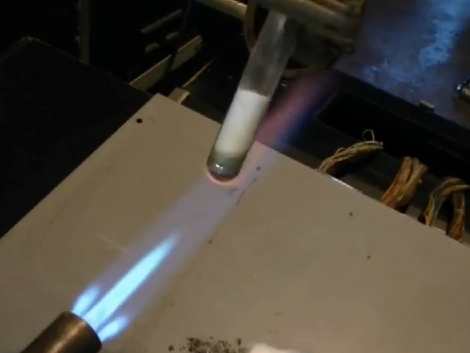 He reports that this technique uses a copper powder suspended in an epoxy intended for spray painting. Before mixing the two he etched the powder in ammonium persulfate, then washed it in deionized water which made it a much better conductor. We gather that the ink was applied with the brush seen in the photo. But since this uses that spray paint friendly solution to host the copper powder we wonder about stenciling with something like masking tape in order to spray the circuit paths onto the substrate. 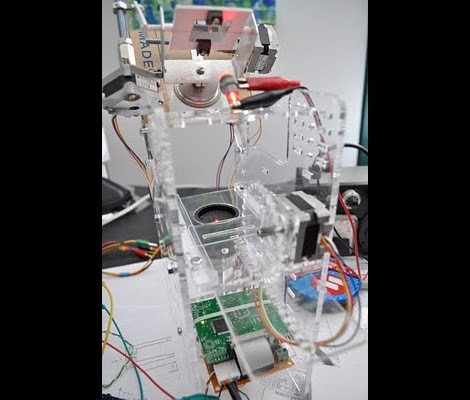 There’s not too much info up yet, but [Nvermeer] does link to one of our other favorite conductive ink projects. Further solidifying her mad-scientist persona, [Jeri Ellsworth] is making glow powder with household chemicals. When we saw the title of the video we though it would be fun to try it ourselves, but the first few minutes scared that out of us. To gather the raw materials she puts some pennies in a bench motor and files them into powder. From there it’s trial and error with different cleaners and tools to create just the right dangerous reaction to get the chemical properties she’s looking for. Check out her experiments after the break. And if you find you’re wanting more, go back and take a look at her EL wire fabrication process.